The scope of Life Sciences industry seems to be enlarging year by year presenting umpteen opportunities to players in the industry to grow their business. However, it needs qualitative data to connect with key decision makers in the industry where Blue Mail Media’s Life Sciences Industry Mailing List can be a great resource. Our database of Life Sciences Executives has been meticulously designed to help you achieve higher interactions, greater conversions and more returns on investments. Blue Mail Media’s Life Sciences Industry Database is the perfect resource for you to execute your multi-channel marketing strategy. Our list gives you comprehensive information to connect with your target prospects via telephone, email or mail. We follow a strict process to maintain the quality of our databases. We collect data from various authentic sources, verify information, and update the same time to time to make sure our data remains updated at all the times. 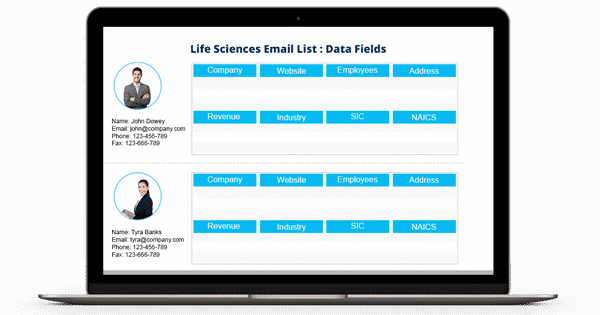 Our Life Sciences Industry Email List has been meticulously designed by our team of data scientists, marketing experts and other professionals to help you achieve maximum success on your multi-channel marketing activities. Apart from pre-packaged lists, we also provide customized Mailing List of Life Sciences Industry Executives that align perfectly with your campaign objectives.